Barker’s Lubov remains alone on stage through the transition of time from one act to the next, her expression measuring her emotional passage of time. Faction of Fools Theatre Company, Gallaudet Eastman Studio Theatre, Washington, D.C.
Dunyasha (Francesca Chilcote, left) and Lopakhin (Kathryn Zoerb) listen for the arrival of Lubov in the Faction of Fools commedia dell'arte production of Anton Chekhov's The Cherry Orchard at Gallaudet University's Eastman Studio Theatre. Photo by C. Stanley Photography, Faction of Fools. Many of us Western theater aficionados think of Anton Chekhov’s plays, such as The Cherry Orchard, as weighty philosophical forays into the tragedy of the human condition. Well, William Shakespeare wrote weighty philosophical forays into the tragedy of the human condition, too, such as Twelfth Night and As You Like It and A Midsummer Night’s Dream, great comedies all. Chekhov thought he was writing comedies, too—he even cited The Cherry Orchard as partial farce—but something has been lost in the translation, whether lingual, cultural, or theatrical (that last is cause for mistranslations of Shakespeare, as well). Some theaters, such as Australia’s Sidney Theatre Company, are beginning to recapture the comic essence of Chekhov’s works in new stagings. 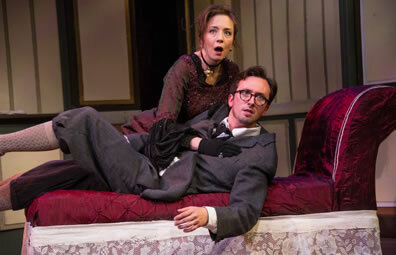 The Washington, D.C.–based Faction of Fools is the latest to do so with its production of The Cherry Orchard at Gallaudet University’s Eastman Studio Theatre. “This production goes back to the source with a different set of tools,” the production’s director, Faction of Fools’ Producing Artistic Director Paul Reisman, writes in his program notes. Commedia dell’arte, first established by Italian street artists in the early 16th century, has influenced all of comedy ever since, from Shakespeare to Seinfeld and, as Reisman’s selection of The Cherry Orchard for Faction of Fools suggests, Chekhov, too. 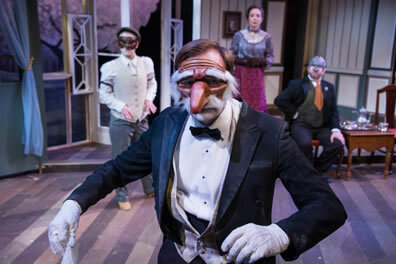 Nevertheless, though Reisman’s direction incorporates the hyperphysical acting, knockabout comedy, and character stereotypes of commedia, along with the masks, this production is not so much a commedia dell'arte version but Chekhov presented with commedia elements. It lacks the cohesion and fascinating insights that Faction of Fools brought to Our Town, Romeo and Juliet, Titus Andronicus, and The Merchant of Venice. If you come for the Chekhov, you might get annoyed with the slapstick sidetracks; if you come for the commedia, you might get drowsy with the Chekhovian dialogue. Still, thanks to some key keen performances, the production achieves both commedia and Chekhovian cred. Notably, those “key keen performances” reside in the production’s two disparate aesthetic realms. Kathryn Zoerb, a Faction of Fools stalwart, plays Lopakhin as a Brighella, a Zanni (servant clown) with a vindictive edge. She’s wearing the Brighella’s dark mask bearing a bully’s aspect. Lopakhin, born a serf and now rich enough to purchase Lubov Andreyevna Ravenvsky’s estate, is “as Brighella as it gets,” Reisman wrote in an email to me after we saw this show. Traditionally played as a middle-class farmer or small-business person, Brighella “is one of the only Zanni that has the ability to exist above his Zanni station,” Reisman writes. From a Chekhovian perspective, what emerges in Zoerb’s portrayal is a man with no emotional capacity whose meanness edges into villainy. He has an obvious (unrequited) crush on Lubov, but this crush is driven by his own ego as he recalls this woman of status, the daughter of a wealthy landowner, showing an interest in Lopakhin when he was a boy. He believes himself due her ongoing affection. However, this Lopakhin lacks empathy for anyone, including Lubov’s adopted daughter, Varya, though everybody expects Lopakhin to marry her any day—including Varya herself (Julia Klavans, playing Varya as an Innamorati, commedia’s maskless young lover). From a commedia perspective, Zoerb nails her Brighella with a hyperphysical performance spurred by Chekhov’s script, and this production serves as her arrival moment among true commedia dell’arte practitioners. Another benchmark commedia performance is turned in by Jack Novak doubling as Fiers, the old butler, and Yasha, Lubov’s young, arrogant valet. Novak plays Yasha in white face, a Pierrot wearing a well-tailored suit rather than the traditional white blouse of the sad clown but, as character tradition otherwise dictates, hitting on Dunyasha the maid (Francesca Chilcote as a Colombina, commedia’s perky female servant). Playing Fiers, Novak dons a beak-nosed, shaggy-white-eyebrows-and-mustache mask, an ancient Zanni moving in super slow motion. His every appearance is a comic highlight, such as the scene in which the other characters discuss a litany of recent deaths, everybody crossing themselves with each mention; Fiers is so slow he’s still doing signs of the cross dozens of lines after the last memorial mention. A benchmark Chekhovian performance is turned in by Sara Barker, making her Faction of Fools debut as Lubov, returning to her estate and its famous cherry orchard after a bad romance in Paris. She’s seeking to find solace in her childhood home despite being on the verge of bankruptcy. Barker has displayed formidable acting skills with WSC Avant Bard, another Capital Region theater company, and she played Varya in an Avant Bard production of The Cherry Orchard. She is called upon here to play Lubov as a La Signora, the elegant mature woman with a horny streak, which she displays in a scene tutoring the career student Trofimov (Faction of Fools veteran Danny Cackley). Despite her lack of commedia experience, Barker manages the physical comedy well, but her La Signora is not masked. Top, Lubov (Sara Barker) tutors Trofimov (Danny Cackley) in the Faction of Fools production of Anton Chekhov's The Cherry Orchard. Above, Fiers (Jack Novak) goes through his slow motions as, from left, Lopakin (Kathryn Zoerb), Lubov, and Gaev (Jesse Terrill) watch. Photos by C. Stanley Photography, Faction of Fools. The thing about commedia masks is that they can display a range of emotions through a commedia actor’s nuanced physical performance, be it a tilt of the head, a brief pause, or a prolonged stillness. Thematically, Barker going maskless is evidence that Lubov still sees herself as an Innamorati; but by foregoing the mask—which Reisman says is not unusual for a La Signora in commedia tradition—Barker also plays to her strengths, achieving the production’s dramatic highlight. The Cherry Orchard’s third act concludes when Lopakhin kiboshes a party by announcing that he has purchased the estate. This moment segues into the final act as the family is packed and ready to leave even as the cherry trees are being felled outside. Barker’s Lubov remains alone on stage through the transition of time from one act to the next, her expression measuring her emotional passage of time: a broke and aging aristocrat, a bad boyfriend beckoning her back to Paris, her childhood home and its vast cherry orchard sold out from under her, and finally facing the reality that she has been skirting reality all these years. It all plays out on Lubov’s face in Barker’s mesmerizing performance. Except for the masks, this production departs from Faction of Fools’ typically cartoonish staging methodology. Costume Designer Kitt Crescenzo dresses the characters in Russian clothing of the late Romanov era, and Set Designer Ethan Sinnott represents the Ranevsky manor with simple realism. The script is cut to a 90-minute playing time plus intermission. While some comedy elements are inserted—such as an acrobatic dance of suitcases carried out by the servants just before Lubov and her party arrive, and Lubov’s teen-age daughter, Anya (Amber James), carrying her mother off stage on her back in such a manner you expect her to start singing “Anatevka”— little is left of the play’s dramatic undertow. The backstory surrounding the death of Lubov’s son five years earlier is completely glossed over. In past Faction of Fools productions, including Reisman’s masterful staging of Shakespeare’s Merchant of Venice, commedia dell’arte serves the plays’ dramatic purposes as well as their comic essence. 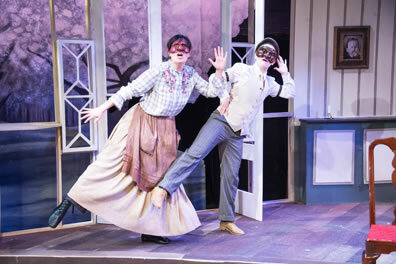 This production seems more intent in proving The Cherry Orchard a comedy and plays more as an exercise in commedia dell’arte application: staging a Russian classic to illustrate the theatrical form’s influence on the Russian playwright. However, The Cherry Orchard doesn’t yield as much through commedia as Shakespeare’s plays do, perhaps because Shakespeare would have been directly influenced by commedia dell’arte, whereas the influence on Chekhov was several generations removed from commedia’s foundation. Commedia does widen our perspective of Chekhov’s characters, but this production doesn’t provide the emotional oomph the company’s landmark commedia production of Thornton Wilder’s Our Town achieved. The exception is Barker when she unspools Lubov’s emotional state of being, trying on different masks with her natural face. Leave it to a commedia production to achieve the most purely Chekhovian moment I’ve yet seen.